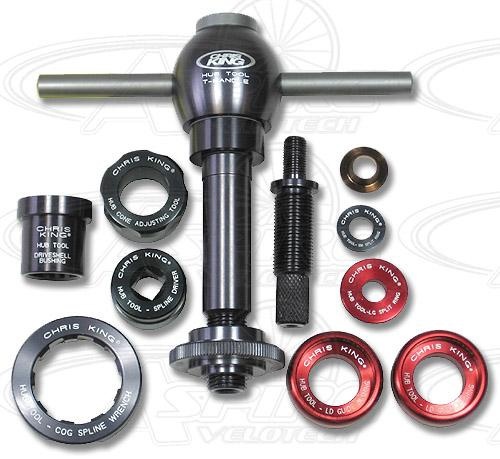 We are honored to offer this Hub Service Tool to you as an authorized Chris King® dealer. This is the right tool and the only tool to use to completely and properly service your Chris King® hub at a professional level. You can completely disassemble and reassemble your Classic, ISO Disc, Single Speed, or BMX hub with this tool. This tool includes a red-anodized Large Split Ring, which replaces the former pewter Large Split Ring, and 2 red-anodized LD Guide Bushings that allow users to remove the bearings in Chris King® 15mm LD and 20mm ISO front Thru-Axle hubs. Like everything that Chris King® makes, even the tool itself is a precision crafted masterpiece. I am a bit confused on what exactly comes with this tool package for its price, can i a bit of clarification of the exactly list. You can check the contents in the description.